The Dynasty Warriors franchise has a new free-to-play MMO coming to the Web. Following the examples of other companies like Electronic Arts, Ubisoft, and Activision, Tecmo Koei is jumping on the social gaming bandwagon. The publisher has revealed that it's making a web-based MMO based on its Dynasty Warriors franchise and it will even give players bonuses if they buy Dynasty Warriors 7 when it comes out for the PS3 in March. The game is going to be called One Million Person Dynasty Warriors, described as "a social game for the popular GREE social mobile gaming service." 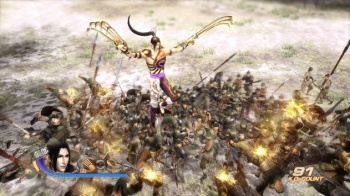 Players will assume the role of a general in the Dynasty Warriors world and work to expand their kingdom by communicating with other players and teaming up with famous historical generals. Present plans include a closed beta test to start sometime in March, and the official launch to take place later in the Spring. Overall, this sounds like a standard free-to-play MMO set with a Dynasty Warriors theme. Tecmo Koei has promised that a serial number will be included with Dynasty Warriors 7, which can be used to unlock a rare weapon in One Million Person Dynasty Warriors (pictured here). The publisher might want to think about using serial number to unlock a better name for the game, too.